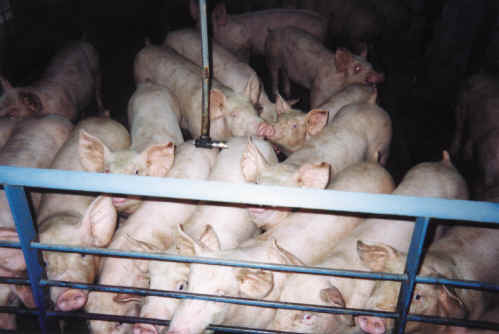 (Pig Exploitation - Factory Farming - 11) When we look into this prison cell crowded with young pigs, we can't help but think of how most little human children want to make friends with young animals, pet them, and love them, just as in Isaiah's prophecy of the peaceable kingdom (Isaiah 11:6-9). However, sometime in their early lives most of these same children are taught to change their love of a fellow living soul into a love for ham and bacon. Instead of being filled with these animals' love, they are filled with their corpses.